There are a lot of players that will be playing in their first Stanley Cup Final for the Washington Capitals, but Brooks Orpik isn't one of those players. The 37-year-old won a Stanley Cup with the Penguins in 2009 and has played in the Cup Final twice in his career. His experience will surely help the Capitals when the series against Vegas starts Monday and it may have also helped on Wednesday night after the victory. As is tradition, the Prince of Wales Trophy was awarded to the Eastern Champion Capitals and Ovi didn't hesitate to pick up the trophy. While he was skating around with it, though, Orpik told him to put it back. There are superstitions associated with touching/not touching the Conference Final trophies and Orpik knows all about them. When he was with the Penguins, Crosby and the team's assistant captains were the only players to touch the trophy. The Penguins went on to win the Stanley Cup that season. The year before, though, Crosby didn't touch the trophy and they lost to the Red Wings. 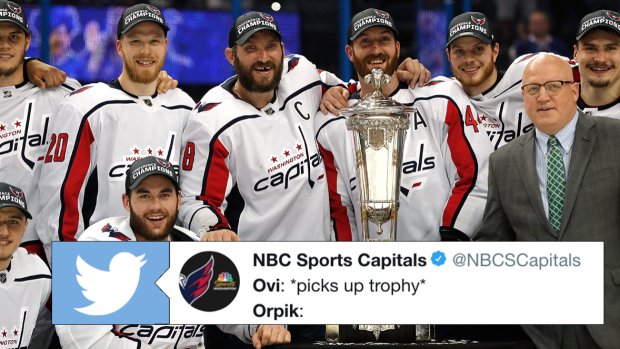 If Orpik is superstitious, he can rest a little easier knowing the Golden Knights also touched their trophy.